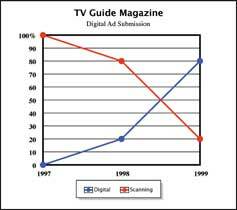 In 1997, TV Guide Magazine's Advertising Production department scanned approximately 15,000 ads. This accounted for 100% of all of the black and white advertising revenue at TV Guide. At the time, the scanning department consisted of four scanners, and averaged one scanned ad per scanning operator every 10 - 15 minutes. That means that in one day, the department could scan a maximum of around 135 ads. At the time, several of TV Guide’s advertisers were pressuring the company to start accepting digital files on disk. This would allow the advertiser to save the time and money involved with printing the ads and delivering them to TV Guide. However, TV Guide’s system at the time was not set up to receive digital files. 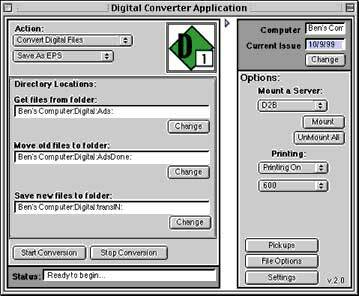 So, in 1997, Ben Waldie, now the president of Automated Workflows, LLC, started the Digital Ad Processing Department as an alternative to scanning artwork. 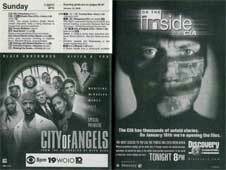 This new area allowed TV Guide to receive digital files directly from the advertisers on disk, CD, or over the internet. In order to make this possible, AppleScript was used to create an automated workflow. This new workflow allowed ads to come in a variety of formats, though PDF was the preferred format. AppleScripts would print the ads and convert them to the correct file format for further processing through TV Guide’s publishing system. In 1997, 100% of all black and white ads were scanned. In 1998, as 20% of all black and white ads were now processed digitally, ad volume increased to around 27,500. This increase in black and white ad volume by over 12,000 ads was made entirely possible because of an AppleScripted automated workflow. 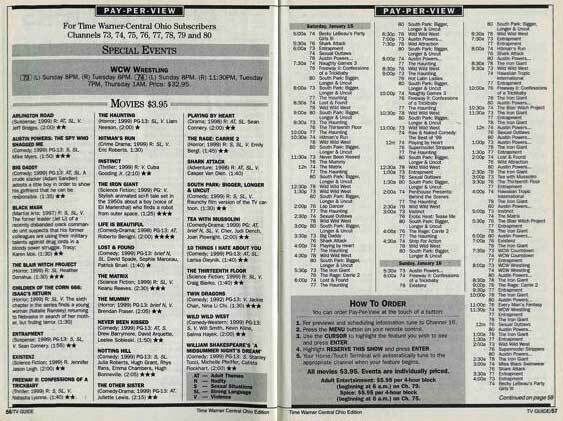 TV Guide’s previous methods and systems would never have been able to handle such a significant increase in black and white ad volume. 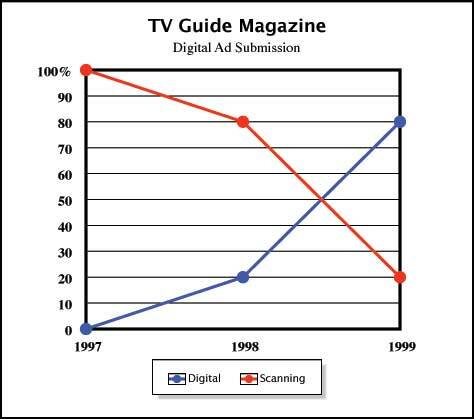 In 1999, TV Guide processed about 37,500 black and white ads, and was processing 80% of these ads digitally at this time. Upon the completion of the automated system in 2000, in an average week, AppleScripts converted over 1500 black and white ads through the digital ad conversion system. The Digital Ad Processing Department could handle converting over 600 ads per day, virtually unattended, with 2 digital operators available to prep and troubleshoot the ads when they arrived. These numbers are amazing when compared to the department's daily 135 ad maximum just 3 years before the new system. And again, this success would not be possible without the use of AppleScript. With the new automated workflow, TV Guide was able to extend its ad deadlines by two to three days. Advertisers could send in a revised ad the same day it went to print, and the ad would still make the book. In addition, the new system improved the quality of ads by handling fully digital files. Advertisers no longer had to worry about scan lines or scanner patterning. 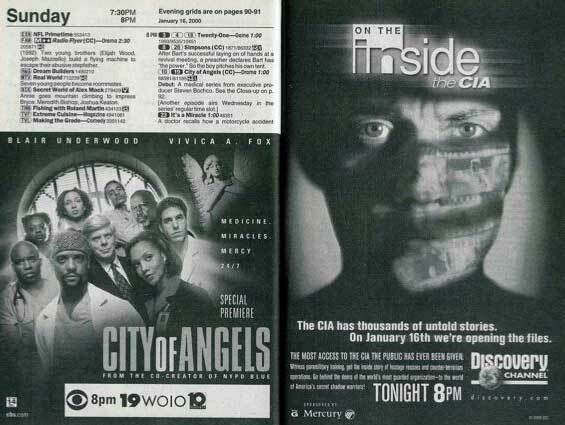 One of the responsibilities of TV Guide Magazine's Editorial Graphics department is to generate several pages of Pay-Per-View listings each week. These listings then appear in various editions of the printed magazine. The process for building the Pay-Per-View pages consists of several steps. First, the proper listings information must be extracted from an Oracle database. Next, it must be brought into QuarkXPress, formatted according to predefined standards, and exported in the proper format. The entire process of building these pages used to take 4-5 designers one full work week to complete. It now takes 1 designer around 20 minutes to build all of the pages. How is this possible? With AppleScript. First, an AppleScript logs onto a UNIX machine through a telnet session and executes a series of commands to extract the weekly Pay-Per-View listings information from the database. The script then flows the information into QuarkXPress, formats it in the appropriate manner, and exports each page as an EPS file. Thanks to AppleScript, TV Guide's Editorial Graphics department is able to save a tremendous amount of resources. Apple Computer was even impressed by this process. Click here to download an article written by Apple about this solution. In addition to maintaining the Pay-Per-View listings system previously described, Ben Waldie, now president of Automated Workflows, LLC, developed several other systems for use by TV Guide's Editorial Graphics department. One such solution was an online job ticket system. This system was created using FileMaker Pro, and was designed to reduce internal paperwork and to increase productivity. When designers need a graphic to be scanned, they simply log onto an Intranet site with a web browser and fill out a job ticket request form. Once this form is submitted, an AppleScript automatically notifies the Advertising Production Scanning department, letting the department know that a job has been submitted. Then, once the scanning is complete, an AppleScript sends out an email to Editorial Production, notifying the department that the scan is done, and indicates where the scan is located. The use of AppleScript to automate these and other time consuming processes has allowed TV Guide Magazine's Editorial Graphics department to greatly increase its productivity and the quality of its work. Over several years, Ben Waldie, now president of Automated Workflows, LLC, worked very closely with various departments at TV Guide to automate many time consuming tasks. The following are some examples of the types of things that Waldie was able to automate. An AppleScript-based solution was developed for use by scanning operators in TV Guide's Ad Production department. This solution was developed to automatically apply LZW compression to ad graphics, as they were scanned. By compressing the graphics in this manner, TV Guide was able to save valuable time during ad processing in other workflows, in addition to reducing server storage capacity requirements. One of the advertising groups at TV Guide is Ad Customization. This group customizes the time and channel information in the national ads of TV Guide’s advertisers. In other words, rather than have an advertiser send in 250 specific pieces of copy, one for each unique edition of the magazine, advertisers can send in one. The Ad Customization team puts the time and channel information into the ads for each edition. During a busy week, TV Guide can have in excess of 65 customizable ads in 250 editions. That’s over 16,000 customizable ads in one week! Once a customized ad is complete, it needs to be proofed. Previously, customized ads were sent to a laser printer to be printed for proofing. Today, an AppleScript application makes these files into PDFs for on-screen proofing. Use of AppleScript in this area allows ads to be proofed much faster, since sending 16,000 ads to a laser printer tends to be pretty time consuming. The script can convert files to PDF much faster than they can be printed, and they can be immediately pulled up on anyone’s machine, regardless of platform, for proofing. Also, Ad customization can now archive all of its customized ads on disk for future reference. This was previously done with filing cabinets, and due to space limitations, the department could only store a few weeks of ads at a time. On screen proofing allowed TV Guide to save a large amount of money on printer supplies. For example, in 1999 alone, TV Guide saved at least $5,000 on printer supplies and repairs in just this one area of Advertising Production. In addition, with up to 16,000 prints per week, this process saved a large amount of money on paper and toner supplies. The ad cropping area of Ad Production also uses AppleScript to proof its ads. Once an ad is cropped to the correct size, it is dropped into a watched folder, where it is picked up by an AppleScript application, renamed, and printed on a high resolution laser printer. AppleScript allows TV Guide to save around $1,000 per week on these proofs, which were previously sent to the Prepress department for output. This was also a very time consuming process. Now, the department gets the ads instantly from the Ad Production printer once they are cropped. AppleScript is also used to create ads for some of TV Guide’s cable advertisers. The process of building these ads used to take an operator about 3 days to complete manually. Now, using AppleScript, the entire process takes no more than a few hours. An operator now creates these ads by choosing graphics from pop-up menus and entering text into specified fields. Next, AppleScript merges the text and graphics with the correct templates, creates the ads, prints them, and makes them into PDFs for further processing. Every 10 hours, a script sends a file to itself through the TV Guide Ad Production ISDN line. If the script does not receive the file back within a certain amount of time, it knows that there is a problem with the line. The script will then send an email to a list of people to notify them of the problem. This allows Ad Production to verify that the ISDN line is working properly without having to manually monitor the line. Click here to read an article from "Publishing & Production Executive" magazine, published in the June 2000 issue. This article talks about Ben Waldie's use of automation for preflighting at TV Guide.